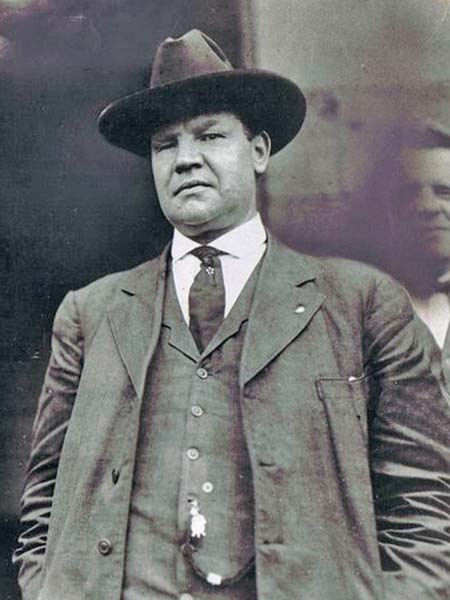 A Visiting American: Big Bill Haywood and Dublin in 1913. | Come Here To Me! A Visiting American: Big Bill Haywood and Dublin in 1913. Big Bill Haywood, American trade unionist. Big Bill Haywood is a hugely important trade unionist in American history. A founding member of the radical Industrial Workers of the World (IWW), Haywood believed in building ‘one big union’ which could represent American workers across all industries, and could ultimately change the very nature of society. A controversial figure who advocated very radical tactics, when he died half of his ashes were buried in the Kremlin wall, while an urn containing the other half of his ashes were sent to Chicago. 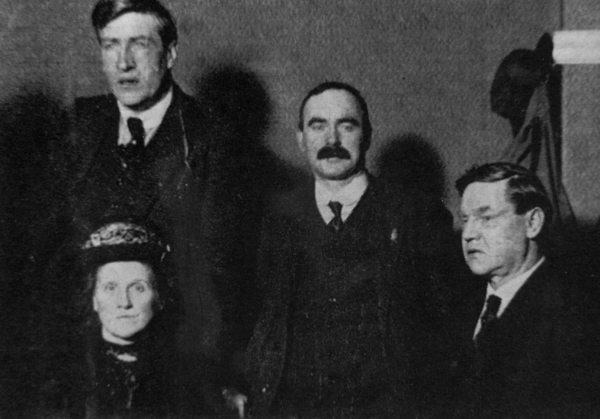 Haywood visited Dublin during the 1913 Lockout, and documented this visit in his autobiography Bill Haywood’s Book: The Autobiography of Big Bill Haywood. It’s an interesting read. He talks not only about his time in Dublin, but also sharing a platform in Britain with Jim Larkin, describing him as a “big bony man with a shock of iron grey hair and marked features such as are appreciated by the sculptor or cartoonist.” When in Dublin, Haywood addressed a demonstration at Liberty Hall, and even inspected the Irish Citizen Army in the company of James Connolly. I had been I Paris not more than a week when I got a telegram from the Daily Herald in London asking me to come and speak on behalf of Jim Larkin, who was then in Mountjoy Prison. I went to see the officials of the Confederation of Labour and told them I was going to England on behalf of Jim Larkin and the Dublin Transport Workers’ strike, and that I would like a testimonial from France to the Dublin strikers- something that the strikers could use. They gave me a check for a thousand francs, a large contribution considering the condition of the workers in France at that time. When I arrived in London a meeting was arranged at Albert Hall. Larkin was released in prison in time to speak at what proved to be a wonderful meeting. Twenty-five or thirty thousand people, more than could get in the hall, had gathered. Some students attempted to disrupt the meeting but the stewards or ushers were well organised and ejected the noisy bunch in quick order. A son of George Lansbury came over the railing of the first balcony and dropped into a struggling group which was fighting to get into the aisle. Another meeting in England, this time in Liverpool, saw Big Bill share a platform with both Jim Larkin and James Connolly. The speakers were Lansbury, Cunningham-Graham, Dyson, Larkin, myself and others. Jim Larkin is a big bony man with a shock of iron-grey hair and marked features such as are appreciated by the sculptor or cartoonist. He is a vigorous speaker and this meeting was the beginning of a crusade that he called the ‘Fiery Cross’. I have never spoken in any meeting with more satisfaction than in this auditorium. I went to Dublin where I met Jim Connolly, the martyr who was taken in 1916 from his sickbed and executed, after being courtmartialed by the British for his leadership in the Easter uprising. I had known him in the United States. We reviewed the Citizen Army on a piece of land that had been purchased by the Transport Workers’ Union. There was a splendid meeting of the strikers in front of Liberty Hall. A cordon of police had been formed on one side. In the course of my speech I referred to the then recent strikes in America and told what the workers could do with solidarity among themselves. I described how the workers booed the police and asked the Irish workers to try it with me once, saying : ‘Now altogether, as loud as you can: Boo,boo,boo!” It was but a few minutes afterwards that the police formed in ranks and marched away. Liberty Hall was a good building owned by the union. In the auditorium I saw a bign sign with the familiar letters: I.W.W. I learned later that these letters stood for Irish Women Workers. on March 27, 2013 at 2:44 am | Reply ‘Lockout’ by Ann Matthews | Come here to me! Amazing photo and story- thanks for posting. Jim Larkin was an avid wobbly in his time in the USA, he even spoke an oration at the funeral of Joe Hill. If only their solidarity could be revived today.